John “Jake” Bell, of Lakeville, Connecticut, pleaded guilty June 6 to illegally trafficking teeth from endangered sperm whales. Bell pleaded guilty today in Boston to one count of wildlife trafficking in violation of the Lacey Act. As part of his plea, Bell admitted that in November 2004, while in the Ukraine, he sold approximately 34 sperm whale teeth to a co-conspirator who resided in Nantucket, Massachusetts, for $11,600. Bell shipped the 34 teeth in multiple boxes from the Ukraine to an associate in Connecticut, from where his co-conspirator retrieved them. Bell’s co-conspirator was convicted in 2010 after a jury trial and sentenced to 33 months in prison. According to the indictment, Bell acquired the teeth and smuggled them into the United States. Bell, who was an artist and scrimshander, carved some of the teeth he sold, but also sold uncarved teeth to customers. According to papers filed in federal court, between July 2005 and June 2006, Bell smuggled in excess of 49 pounds of sperm whale teeth into the United States, valued in excess of $26,000. Also, according to these filings, between June 2007 and April 2008, Bell sold nine carved teeth to customers in the United States, with a total value of $20,300. The Marine Mammal Protection Act and Endangered Species Act protects sperm whales and prohibits their parts from being sold in interstate or foreign commerce or imported into the United States without a permit. Wildlife authorities seized sea turtle skin boots, whale teeth, elephant and walrus ivory and pelts from a Sumatran tiger, leopard and jaguar during undercover operations target online sales of protected species. Operation Wild Web resulted in 154 “buy/busts” in the United States: 30 involving federal wildlife crimes and 124 for violations of state wildlife laws. It also exposed online trafficking of live birds and tiger and leopard pelts in Southeast Asia. 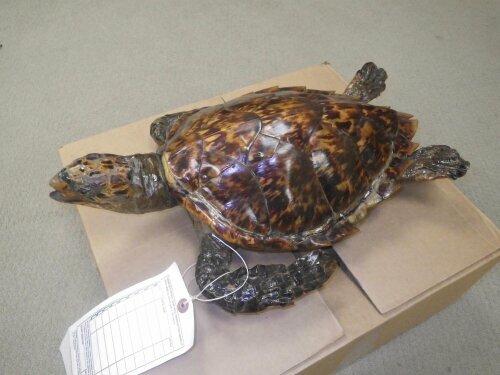 Over a 14-day period in August 2012, approximately 70 Service special agents and conservation officers from State wildlife agencies across the country teamed up to investigate illegal online commerce in wildlife. Agents from the National Park Service and National Oceanic and Atmospheric Administration helped staff some of the 14 “taskforce” groups operating in the United States. Wildlife officers in Singapore, Thailand and Indonesia simultaneously ran their own in-country Operation Wild Web taskforces targeting illegal wildlife internet sales. Additional information is at http://www.fws.gov/operationwildwebrphotos.html.